Hi guys! 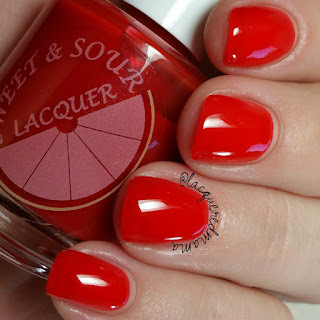 Today I have a yummy collection from Sweet and Sour Lacquer to share with you! 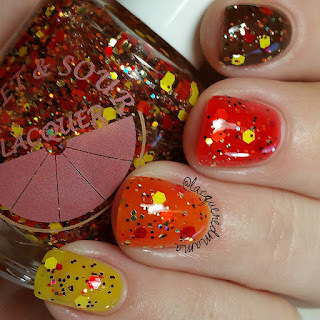 The "Thank You, Come Again" Collection features four jelly polishes and one fun glitter topper! The colors are perfect for this time of year and match their inspirations perfectly! Hope you like Chinese Food! Each of the first four colors are jelly polishes. 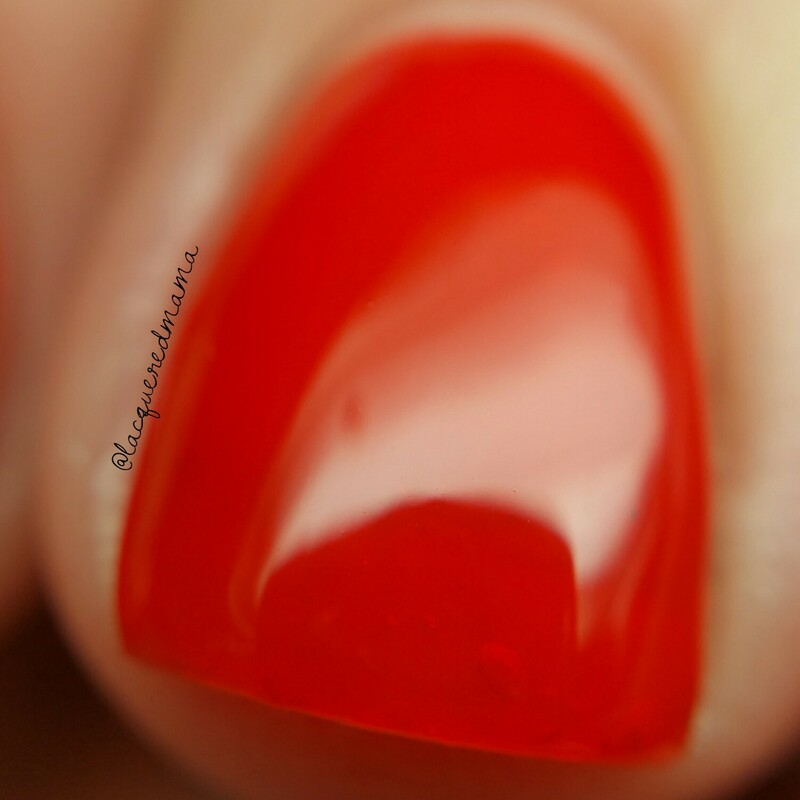 For you newbies, that basically means that they are sheer, but almost opaque in a few coats. The more layers you add, the deeper the color. Some may become opaque in a few coats and some may never cover completely. They also have a fun "squishy" appearance to them. Jelly's are great on their own, but are perfect for doing Pond Manis, Jelly Sandwiches and for use in Lead Lighting! 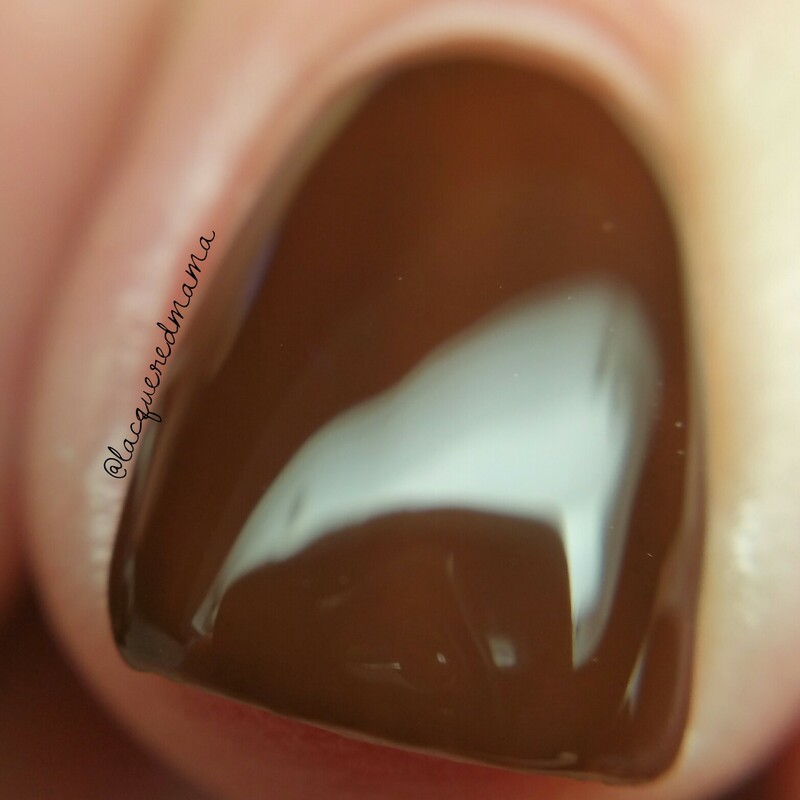 I also like to put one layer over an opaque creme to give my mani the squishy look without all the layers! Soy Sauce is a brown jelly with a very slight red undertone. 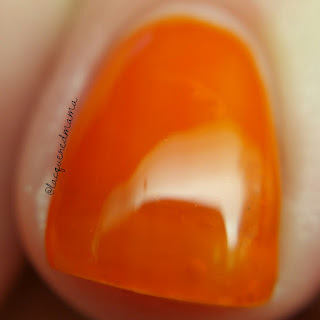 Here I did three thin coats and it is almost totally opaque! Sweet and Sour Sauce is a gorgeously, bright, fire red jelly! 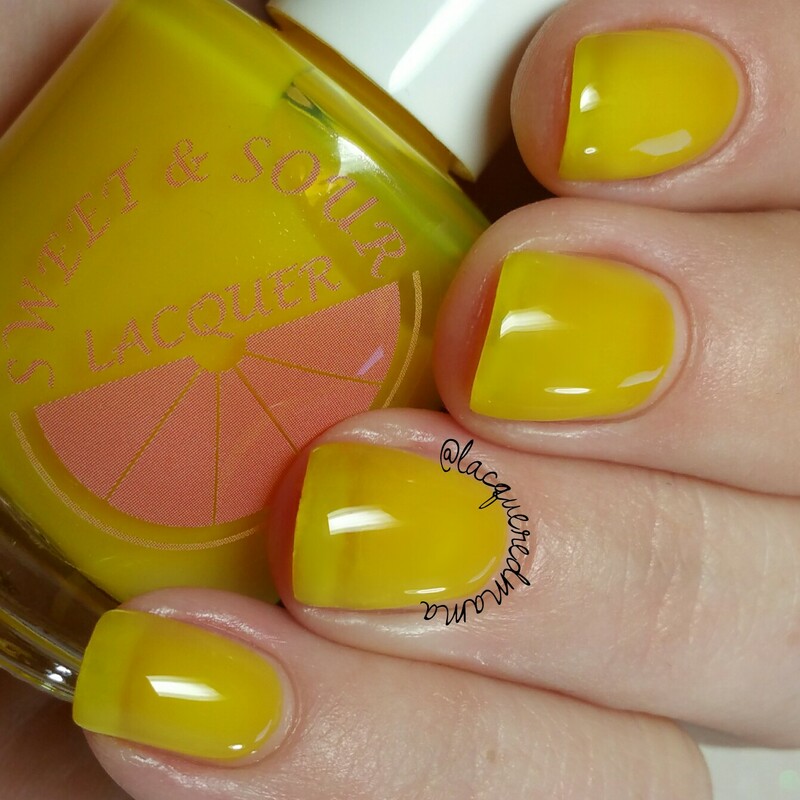 As far as jelly polish goes, this formula was awesome! Two coats were completely opaque for me! Duck sauce is a yellow toned orange jelly. This is one that is a little more sheer. Here I did three coats and you can still see my nail line pretty clear. 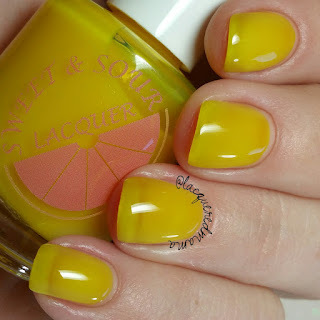 Lemon Sauce is a pretty bright canary yellow jelly! 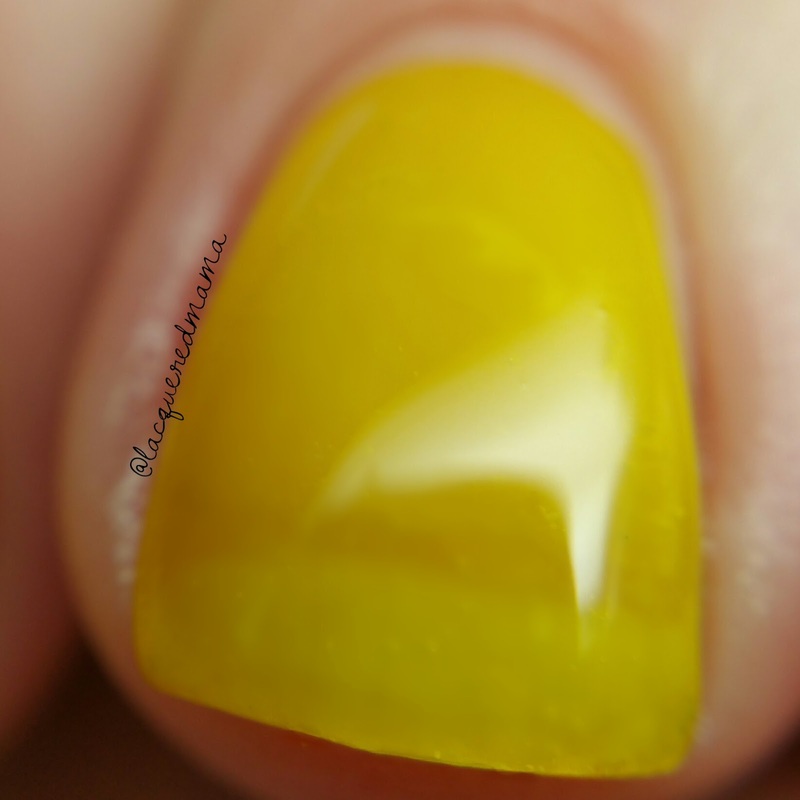 Another that is sheer on it's own, but would be great over a similar colored base or layered over some nail art! 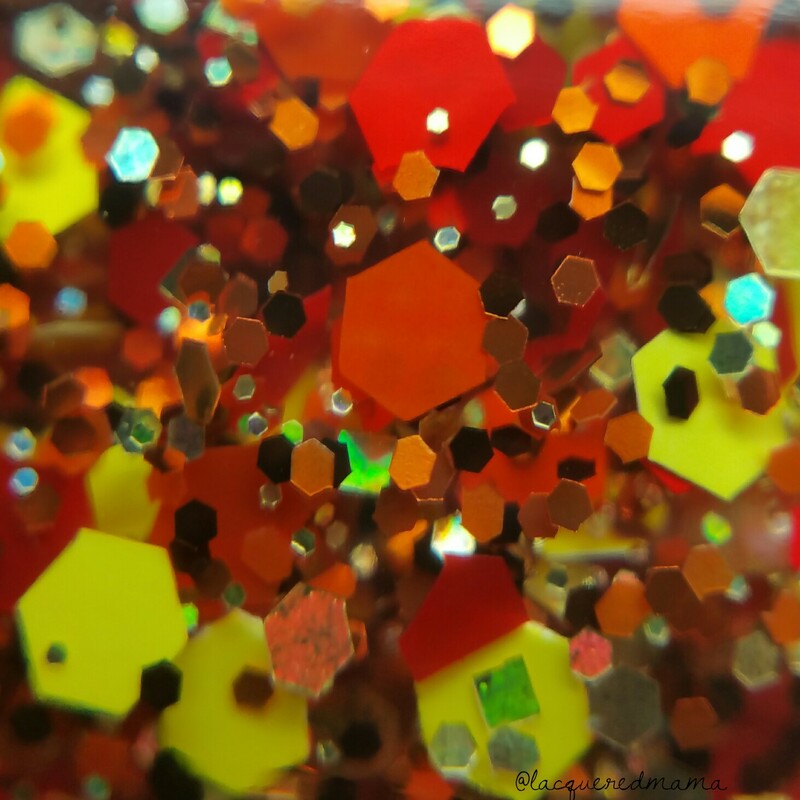 Firecracker Chicken is a clear jelly base filled with small copper/brown metallic hex glitters, as well as larger matte hex glitters in red, yellow and orange! 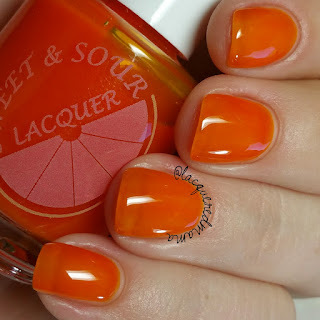 Here I did one coat over each of the jelly polishes in the collection! Super cute collection! Makes me want Fried Rice and Wontons seriously bad! Mmmmm! I'm hungry! The Thank You, Come Again Collection will be available in Sweet and Sour Lacquer's shop on October 21st! Be sure to follow them for exact release time! the red has so many possibilities for me! 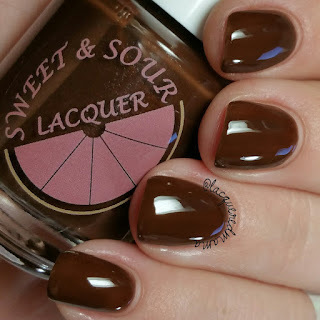 I'm in love with that brown! These are super-juicy! I love a squishy jelly! Oh man, squishy jellies are so fun! I love that glitter, too!